Adult circumcision is most often performed for true medical necessity, at least in Western societies. Although reported complications are few, they can be significant, and hence expertise is necessary. Unlike newborns, the adult will have already maximized his penile growth after puberty. Thus, it becomes more important to assure that adequate shaft skin is protected when doing a circumcision. 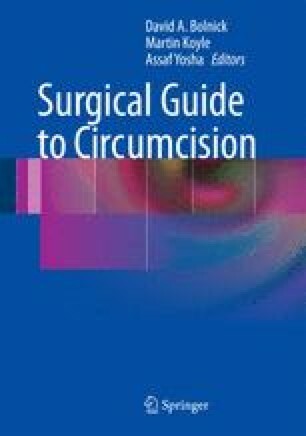 There are many variations of available techniques and, hence, most urologists and surgeons will incorporate their own preferences when performing adult circumcision. Today, with more adults requesting foreskin preservation, prepucialplasties might be offered in select cases. Proper informed consent, of course, becomes essential. World Health Organization and Joint United Nations Programme on HIV/AIDS. Male circumcision: global trends and determinants of prevalence, safety, and acceptability. 2007. http://www.malecircumcision.org/media/documents/MC_Global_Trends_Determinants.pdf. (accessed 11 Dec 2011).